Would Scotland be better off or worse off under independence? I've often been told that England subsidises Scotland, that Scotland already gets "more than its fair share", and that independence would bring that to an end. Is it true? Before buying independence, I'd better perform due diligence. I'm in favour of independence, so I wanted to examine the figures provided by someone against. I found this report by Brian Ashcroft, an emeritus professor of economics from Strathclyde, who argues Scots would be better off remaining with the English. (His collected posts on independence are here.) Examining his argument for dependence leads me to the conclusion that independence is essential. 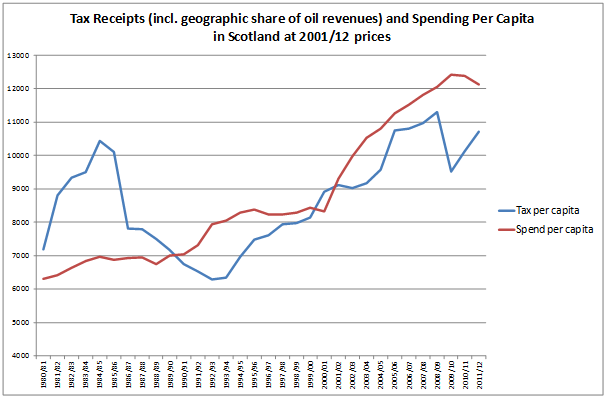 The graph above, taken from Ashcroft's report, shows that in recent years, Scottish spending has exceeded Scottish revenues (including from oil). Uh oh! However, he mentions briefly, and a web search confirms (see graph below, from The Guardian) that UK spending has exceeded revenue by a far larger amount. I think this shows that Scotland is in better shape for independence than the UK as a whole, because we would have less debt, assuming it was fairly allocated. Ashcroft argues that Scotland has gotten back what it contributed in oil revenue, so that everything is hunky dory, but that doesn't ring true if one considers that over the same period the UK margin of spending over revenue was far greater than Scotland's. Ashcroft's most significant point, in my view, is that going forward Scotland may have to pay a higher rate for borrowing than the UK, but if the Scottish economy is better managed for growth than the UK, then this would pale into insignificance. As the graphs show, we have a problem: but it is a smaller problem than the UK as a whole, and we have a better chance to solve it on our own. Better together? I don't think so.